The abundant cultural and historical resources in our downtown cityscape offer Sayre teachers yet another way to enliven the curriculum and provide memorable learning experiences for their students. Currently immersed in Kentucky history, Sayre third graders have closely followed Lexington news and discussed the role of monuments in our downtown. 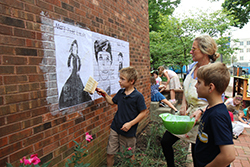 Determined to broaden the dialogue about public art in the city, students created the first public mural celebrating Lexington women in history who represented innovation, courage and intelligence. "The Lexington community has dealt directly with the issue and placement of the confederate monuments that are currently located in Cheapside Plaza. As part of the conversation, Council Member Jennifer Mossotti brought to the attention of the Urban County Council that while Lexington has plenty of statues of men, horses and even a camel, there are none of women," said Georgia. The 16x9 foot mural features three outspoken crusaders for civil rights including: Mary Ellen Britton, a highly educated African American woman who became the first female physician in Lexington; Madeline McDowell Breckinridge, a progressive reformer and fearless leader of the women’s suffrage movement; and the wife of President Abraham Lincoln, Mary Todd Lincoln, who loyally supported her husband and the Union to abolish slavery, even though Mary’s brothers served in the Confederacy and her parents were slaveholders. 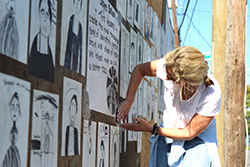 The Sayre student mural is wheat pasted on a downtown Lexington building at the corner of Eastern and Third Street. Be sure to take a moment to view the portraits by these creative artists!